Facial thread veins or broken red veins (telangiectasia) are superficial red, purple or blue veins often appearing around the nose and across the cheeks chin and chest. This happens when veins dilate, enlarge and become visible through the transparency of the skin. Thread veins are effectively and quickly treated with Intense Pulse Light (IPL) without risk in just a few easy treatments. How does the IPL treatment work on thread veins? 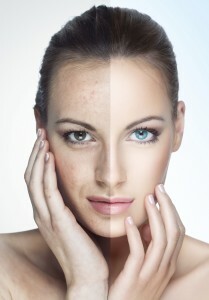 Cheshire Aesthetic Clinic’s IPL laser system emits light which is absorbed by the blood vessels, heating them to the point where they are destroyed. The vessels then quickly clear as they are reabsorbed by the body, leaving hardly a trace or no trace of the original lesion. During your IPL session a thin layer of chilled gel is applied to the skin to aid light absorption. The light is pulsed over the treatment area, after which the chilled gel is removed and the area cooled. In most clients’ cases, Cheshire Aesthetic Clinic recommends three to four treatments to achieve the best results – small lesions may clear in a single session. For general redness and rosacea five or more treatments may be required. Repeat sessions are recommended every four to six weeks. Treatment is quick and can be just 10 minutes for a single lesion or up to 45 minutes for a larger area. Results are long-lasting. 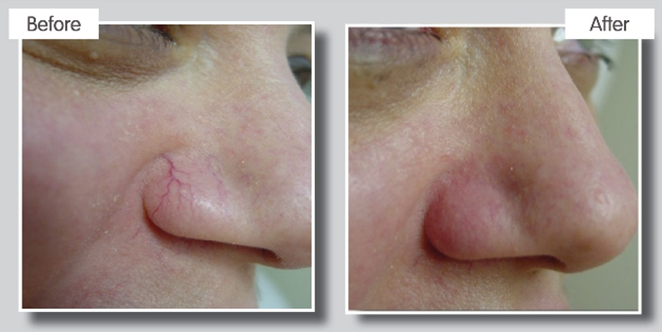 After your IPL treatment, most thread veins will disappear but some may re-occur, less prominently, a few days later. Further treatments will ensure these vessels disappear without likely recurrence. Clients who have a tendency towards facial redness are more likely to have new veins appearing in the future requiring treatment, which our recommended maintenance sessions will monitor.